Could Cryptocurrency Investments Revolutionize Healthcare System? The healthcare industry has naturally been one of the active areas of exploration as the world scrambles to find applications for cryptocurrency. The risk-averse nature of the medical industry combined with the enormous cost needed to initiate any change in healthcare has been a major barrier to change. As a result, the healthcare industry is renowned for being slow at adopting new technologies. Xi Safety Inc today looks at the Canadian Utility Safety Designation presently being offered in Canada. 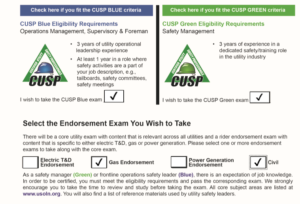 The Certified Utility Safety Professional certification program is the only program that offers safety credentials to utilities, related contractors and communication providers. It is designed to provide a career path and individual growth for employees and increased value for employers. The BCRSP has proposed a new safety designation called the Canadian Registered Safety Technician Designation. We have added the CRSP Exam preparation workshop to our Xi Safety Inc training database. Prospective CRSP students can now log into their account at the Xi Safety Inc website and work at their own pace for study. The workshop is 8 hours in length and one of the advantages is you can go back and review all of your materials and do the quizzes to prepare for your exam. Purchasing courses for others? Click here. Canadian Registered Safety Professionals (CRSPs) are people employed in the occupational health, safety, and environmental field in a professional capacity, as practitioners, consultants, or educators. CRSPs use a combination of engineering, human, and physical sciences to develop and implement programs, systems, procedures, and techniques for the reduction and elimination of losses. The CRSP designation is now a widely accepted form of recognition by industry and government in Canada. Many employers in Canada require applications to have the CRSP designation in order to qualify for safety positions. This CRSP Exam Preparation Workshop is designed to prepare eligible candidates for the Board of Canadian Registered Safety Professionals (BCRSP) Exam. As an alternative to the CRSP Exam Preparation Workshop, you can purchase the online CRSP Practice Exam Practice Questions, which will provide you access to a bank of over 1000 questions based on the BCRSP competencies without the additional course material. A minimum of a 4-year bachelor’s degree in any field or a 2-year diploma (or certificate) (minimum of 900 hours or 60 credits) in occupational health and safety or a closely related field from a recognized academic institution. At least 4 years of experience where occupational health and safety duties comprise at least 50% of the applicant’s work responsibilities. Testing conducted in this online CRSP Exam Preparation Workshop program is designed to reinforce the information presented. A mark of 90% must be achieved in order to receive a certificate of completion. Participants are able to repeat the course twice if the pass mark is not achieved. The Certification Management Program (CMP) applies to each CRSP who must earn a minimum of 25 CMPs within a 5-year period to maintain certification. It starts January 1st of the following year. The system of credits will require a reasonable degree of effort in activities contributing to continued professional development but should not be unduly difficult for any CRSP to meet. A detailed breakdown of these categories with allocated credits will be provided to all candidates on successfully achieving the CRSP designation. CMP information may also be viewed on the Board’s website. eir own pace to study in preparation of writing the CRSP Exam.